Soldier seriously injured in stabbing attack at Al-Fawar junction has been moved from intensive care to ear, nose and throat department. The condition of the IDF soldier seriously wounded in the stabbing attack at the Al-Fawar junction on Wednesday has significant improved, Shaare Zedek Medical Center announced Thursday afternoon. The soldier, who was initially hospitalized in the hospital's intensive care unit, has just been transferred for treatment with a specialist in the Ear, Nose and Throat Department. 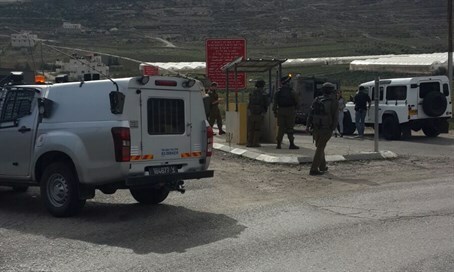 The attack, in which a Palestinian terrorist stabbed the soldier in the upper body, occurred at the same intersection south of Hevron where terror victim Avraham Hasano was run over and killed. Hasano, a resident of Kiryat Arba, exited his car after Palestinians pelted it with rocks, only to be trampled by a Palestinian truck driver. Shaare Zedek also reported that the 22-year-old soldier lightly injured earlier this week during the stabbing attack at a gas station on Route 443 had been released from the hospital. 18-year-old soldier Ziv Mizrahi was killed in that same attack.